The Relocation Specialist Advisory Councils will be meeting in the next few weeks, and we want your input. The councils meet a few times a year to discuss ways to improve the Relocation Specialist software. Though the members are the ones who will be discussing the agenda items at the meetings, we want to know what you think. Most of the valuable software features have come as a result of the software users making suggestions. Please let a member of the ReloSpec Team know your suggestions. We are eager to continue improving this great software! And, if you would be interested in serving on one of the Advisory Councils, let us know. We meet 3-4 times per year during a telephone conference call that lasts about an hour. There are typically 2-3 emails prior to and just after the meetings to review agendas and follow-up on meeting notes. Let us know if you would like to join the Advisory Council. By now you have probably noticed the three new fields in the Referrals List page used for storing images of the agent(s) and the client. These are because of the newly enhanced Images option. The Relocation Specialist Images option has been used to “go paperless”. It allows you to upload images of scanned contracts, BMAs, Word docs, PDF files or any file you want to associate with a referral record. The Images option now includes the ability to upload pictures of Clients and/or Agents for use with outgoing forms. So now when you want to send the updated ‘Client Notification of Agent’ form it will now include a picture of the agent along with the other agent details like Name, Email Address, Website, etc. And, when you want to include a picture of your Client/Transferee with the new, simplified ‘Outgoing Information Sheet-F‘ you can! 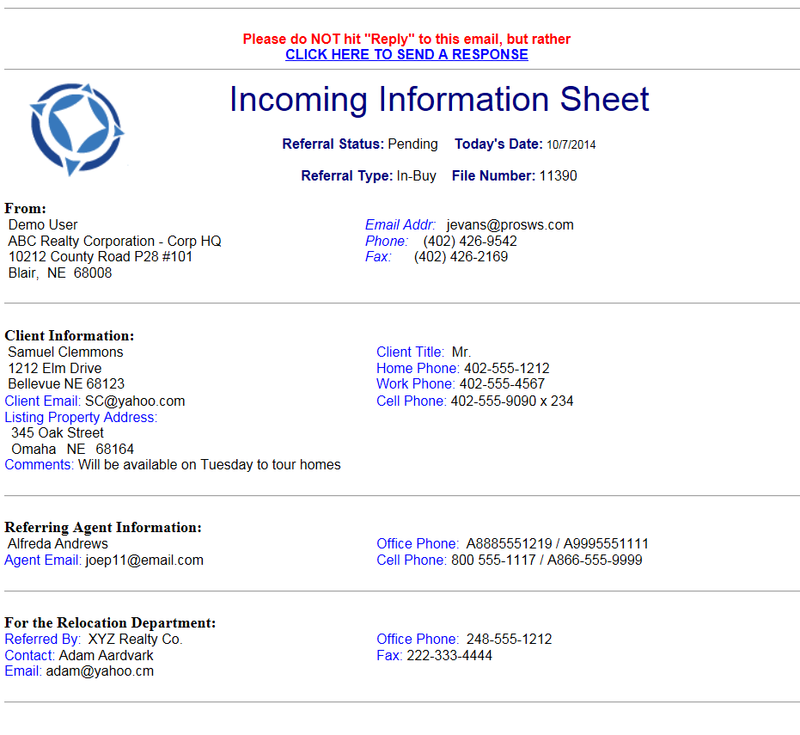 This new form is a great way to send only the information needed for an outgoing referral. And, it now may also include a picture of the client! There is a new 7-minute Training Video with instruction on how to use these powerful new features. We hope you enjoy the new features and the two new forms. The schedule for the 30-minute web seminars (webinars) has been updated with classes between now and the end of the year. The webinars are free and pack lots of great ideas for saving time with Relocation Specialist. Why not take a minute now to schedule the webinar(s) you need. Here is the link for the Web Seminar schedule. Do you need a short, simple version of the ‘Incoming Information Sheet’ for your agent and others? Check out the new ‘Incoming Information Sheet-K’ which is a shortened version of the many other Incoming Information sheets. This version includes the newest features including the ‘Click here to Respond’ link that allows the agent to send responses (if any) directly to your Responses page. (No more copy/paste of emails!) Plus, if you send this new form manually, without using the AutoPilot, ReloSpec will add a note automatically including the Date/Time, Who sent the form, the Email Address of where it was sent and which form was sent. Cool! To view a sample of this new form, click here.